It was a pleasure to catch the end of the Spanish Grand Prix last weekend – seeing Pastor Maldonado winning for the Williams team. The race saw Lewis Hamilton demoted to the back of the grid from Pole after a technical penalty on fuel load and Kimi Raikonen edging his way ever closer – but the podium was Maldonados and the celebrations were huge. This season there have been 5 races and five winners. There is no one powerful monopoly – there is perfect competition. I dont know what changed in the rules this year but its a time for passion and innovation and the trophies are being shared amongst the gutsy. 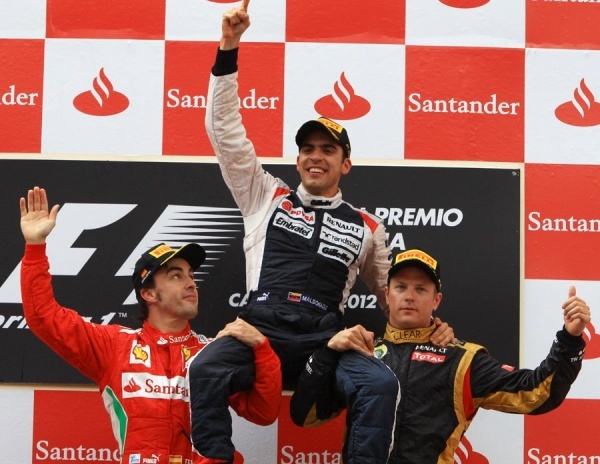 I really liked the scenes of Maldonado on the shoulders of Alonso and Raikkonen – its not seen every week (if ever!). Alonso can sulk for Spain and Kimi is a man of little words – but you could see they were generously pleased for the Venezuelan. Not just becasue he had his first win but because of who he is and how he conducts himself away from the races. To be the linchpin you need talent and perseverance – but to really win you need to have charm and humilty too. It was a big weekend for Williams – when I was a kid they were number one but this is their first success in a long time – it was FW’s birthday that weekend – turning 70 with his family all around. Those are special moments and I liked being part of them. To learn, be really quick, do my best for the team and improve race-by-race. Now he has to learn to be a winner too. But not by loosing the people around him. Categories: Life | Tags: humility, learning, Linchpin | Permalink.